Good Practice, Meh Practice – Love. Life. Practice. Good question. And I’m going to answer it by completely changing the subject. Many years ago I decided I wanted to try National Novel Writing Month. This was before I had ever really completed a story, much less a novel. If you’ve not heard of it, NaNoWriMo is in November, and it’s when you commit to writing 50,000 words in 31 days. “Quantity, not quality!” is the mantra and battle cry, and the aim is to prove to you that you can do it, that all you really need to do to write a novel is sit down and write. That first NaNoWriMo was a heady, exciting time. I recall the last 7000 words, frantically typed in the wee hours of the morning with my online friends from LiveJournal (this was pre-twitter and really FaceBook wasn’t much either) cheering me on as I neared the finish line. It was hard to fit in the time to write for that month, as I had a house with four kids, a wife, an entrepreneurial-type job and more. But I did it. I got my 50,000 words written, and I got my NaNoWriMo badge to put on my website. I don’t know that I’ve ever felt so proud in my adult life. So of course I decided to try it the next year. Again, it was kind of hard…but not as hard. I was able to add a little quality (such as researching NYC night clubs) to the process, and ended up with what I thought was a nice little sequel to the first book. Two books! I’d gone from writing zero novels to two in two years! It’s not hard to say that it was totally worth the effort for those two Novembers. Even though I wasn’t able to NaNoWriMe the following year, I was starting to do more writing professionally under both a pen name for my romantic fiction (no, I won’t give that away) and as myself for a variety of publications. I got writing jobs, in fact, for places like LoveToKnow.com and FameOrFamine.com. Two years ago I felt like my writing had plateaued – it was the first sign of that “Great Work” that I want to do – and so I thought I’ll just NaNoWriMo again! Come November 1, I sat down, and started writing. Four hours later I had 10,000 words, without breaking a sweat. You realize what that meant. I could have conceivably kept up that rate (as long as we were going for quantity, not quality) and have a 50,000 word novel done in less than a day. There was no challenge to it. 50,000 words in a month? Heck, I regularly do over 12,000 words a month just on this blog, and that’s about an hour three days a week. 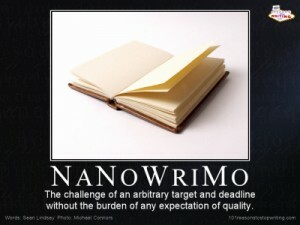 I love NaNoWriMo, and I recommend it to everyone…but it is not for me, anymore. Of course, I could do NaNoWriMo anyway. I could get the badges every year, and hold up the self-published works that I churn out, and tell people “Yes, I’ve written many novels…” And not have one that I felt was that “Great Work.” It would be much like the difference between practicing piano for twenty years vs. practicing one year of piano twenty times. That’s what that cigar job would have been for me. It’s what Steven Pressfield calls “Resistance” but I would call “Lazy Success.” I would be writing about cigars other people found, in order to help them sell more cigars (in other words, no bad reviews), and I’d have to write them in their company’s voice – not my own. I would have lots of work, lots of time spent with sound and fury signifying nothing. It would be a way for the lazy part of me to avoid having to find my own voice, my own way of writing about cigars, because Look! I’m a Cigar Writer! I get paid and get cigars and everything! I could probably get away with it for a few years, at least. Then that Great Work would rear its ugly, unfinished head and say “Yo. Gray.” Trust me, it’s a scary, deep voice, gravelly with inexorable patience that says I will not go away until you complete me. Now, Joe is right that it could be fun to have both combined, and if I wasn’t already sure that I could write that kind of work it might be the perfect way to try and hone my talent. Plus, it might just be fun – if I had the time to do it without taking away from my other, more authentic work, there would be nothing wrong with it. In a class I taught this weekend on finding your Defining Moment, I mentioned that it should be a life-changing experience. A woman raised her hand and said “What if it’s just fun? What’s wrong with that?” The answer, of course, is nothing. Life should be fun! But if your practice – whatever it is – is just “meh practice”, it’s not actually getting you anywhere. You’re running on a treadmill, with perfect form and building endurance and not getting any closer to your destination. Good practice, on the other hand, is hard. It involves failure, exhaustion, uncertainty, and only occasionally the triumph of discovering you’ve reached a new level of skill, discovered a new place within your own personal geography, found another frakkin’ growth opportunity. It’s easy to fill your time with Meh Practice and fool yourself and others into thinking you’re actually doing Good Practice. But only for a while. Because the work knows…and it won’t leave you alone forever. With special thanks to Jenna, Matt, & Siobhan as well as Maui K, Inc. for making it possible to write this entry on the beach at Ho’okipa.